In 2016, Patek Philippe is celebrating the 40th anniversary of its casually elegant Nautilus collection. For many aficionados and connoisseurs of classic watchmaking artistry, this is a memorable occasion as well. A look back to 1976 not only shows how quickly and dramatically the world has changed since then but also illustrates how well the Nautilus has stayed its course across four decades in terms of design, dependability, and popularity. With two limited-edition Nautilus 40th Anniversary models, the manufacture manifests its ability to keep pace with the times while preserving the key facets of a legend. The year 1976 was in the middle of a decade characterized by social, economic, political, and cultural upheavals. A spirit of invigoration emerged to finally overcome the somberness of the post-war years. Anything that was pleasing was also permissible. That applied to hippies and to those people who set up businesses in garages during the fledgling years of the computer industry. Growing affluence freed leisure time for sports, travel to faraway places, cultural interests, and intellectual discourse. People worked to live rather than living to work. Philippe Stern was a typical representative of this generation. It was his grandfather Charles, along with brother Jean, who in 1932 had acquired Patek Philippe, a respected watchmaking company. In 1976, Henri Stern was president of the family-run enterprise, and his son Philippe, who already held an executive position, was poised to succeed him. It was the right time for a showpiece, so he decided to launch a sports wristwatch for the first time in the 137-year history of the manufacture. In close collaboration with Gérald Genta, one of the most gifted watch designers of the 20th century, an innovative timepiece began to take shape, one unlike any seen at Patek Philippe or in the entire watch industry for that matter: the Nautilus Ref. 3700/1A. It was voluminous and made of steel, although the prevailing trend favored very slender watches in gold. It was water resistant to 120 meters, a sensation at the time. And unlike any other wristwatch, it embodied a maritime, nautical aspect: Philippe Stern was a passionate skipper and successful regatta contestant on Lake Geneva. The salient features of the Nautilus Ref. 3700/1A were two lateral case extension ridges at 9 and 3 o'clock, resembling hinges that joined the two-part case ensemble (conventional cases consist of three parts). They were inspired by the locking mechanisms of classic ocean liner portholes that could be sealed to prevent the ingress of water. The crystal was framed by an octagonal bezel with gently curved sides and rounded corners, satin-finished on the upper plane and mirror-polished on the beveled flanks. The solid stainless steel bracelet featured the same matt/gloss effect. Despite its ruggedness, it was surprisingly supple on the wrist. The dial, in a blue-tint charcoal, stood out with a horizontal embossed pattern and was graced with applied luminous baton hour markers to match the slender luminous baton hands. For this oeuvre, the name Nautilus was a perfect fit, whether it was associated with cephalopod mollusks and their beautiful spiral shells or with Captain Nemo's submarine that Jules Verne dispatched on a perilous expedition in his book Twenty Thousand Leagues Under the Sea. 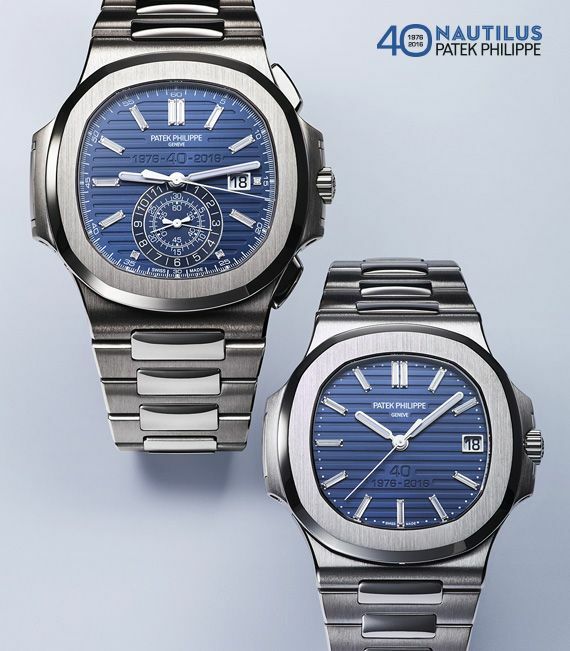 Patek Philippe also explored uncharted territory with the Nautilus launch advertisements and headlines such as "One of the world's costliest watches is made of steel" and "It goes with a wetsuit as well as with a tuxedo". Pioneers don't always have an easy start. But within just a few years, it turned out that the argument behind the Nautilus casual AND elegant carried far more weight than concerns regarding the size of the watch and stainless steel as the case material. Those who possess an original Nautilus Ref. 3700/1A today own not just a milestone in horological history but also a precious collector's piece envied by scores of watch enthusiasts. The subsequent history of the Nautilus follows a stringent logic that is illustrated in the annex with the chronological model overview spanning the last 40 years. The original Nautilus Ref. 3700 was launched in steel in 1976 and remained in the collection until 1990. The gamut was continuously extended with further models featuring different case metals, sizes, and dial designs. Key debuts included the 1980 Ladies' Nautilus Ref. 4700/51J as well as the 1981 Ref. 3800/1 and Ref. 3900/1 midsize models. They were followed in 1996 by watches with Roman numerals (Ref. 3800/1JA) and the first model with a leather strap that foretold the launch of the Aquanaut in 1997. The first complicated Nautilus Ref. 3710/1A with a winding zone indicator IZR was presented in 1998, followed in 2005 by the Ref. 3712/1A, which was the first model endowed with a moon-phase display and a power-reserve indicator. To commemorate its 30th anniversary in 2006, the design of the Nautilus collection for men was subtly reworked, the two-part case superseded by a three-part construction, and crowned with the launch of the Ref. 5980/1A self-winding flyback chronograph model. The 2010 launches introduced the Ref. 5726A Annual Calendar Nautilus with a leather strap (the Ref. 5726/1A bracelet version followed in 2012) and the first chronograph with a leather strap (Ref. 5980R). In 2009, in cooperation with Gérald Genta, the ladies' collection was delicately reworked and updated. New versions with leather straps and steel bracelets as well as more feminine dials were added in 2013. The first self-winding Ladies' Nautilus (Ref. 7118/1A) in steel without diamonds was presented in 2015. The limited-edition Nautilus models launched on the occasion of the 40th anniversary subtly allude to the history of Patek Philippe's first casually elegant model family. The Ref. 5711/1P with the 40-mm platinum case pays tribute to the original Nautilus Ref. 3700/1A "Jumbo" dating back to 1976, while the 44-mm Nautilus flyback chronograph Ref. 5976/1G salutes the tastefully redesigned 30th anniversary collection introduced in 2006. Both models feature a blue dial with diamond hour markers, the typical Nautilus embossed decor, and a discreet recessed anniversary logo. The Nautilus Ref. 5711/1P 40th Anniversary will be available in a limited edition of 700 watches. With its platinum case, it perpetuates a grand tradition that began with a stainless steel debut model in 1976. It is reminiscent of the original Nautilus Ref. 3700/1A, but also suggests the subtle evolution of the model line during the past 40 years. With a width of 44 mm (including the crown), the new Ref. 5711 is a rather large watch. But 40 years ago, this also applied to the Ref. 3700/1A, which although 2 mm narrower was so large in its time that it was nicknamed "Jumbo". This was perhaps a tongue-in-cheek allusion to the Boeing 747 Jumbo Jet that stood for the public's growing desire to travel and from 1969 on remained the world's largest passenger jet for nearly 4 decades. Additionally, 2 millimeters, as little as it may seem, makes a big difference on the wrist. Patek Philippe's watch creation department realized that proportions have changed in the past decades. The new format befits the Ref. 5711/1P Anniversary Nautilus very well. 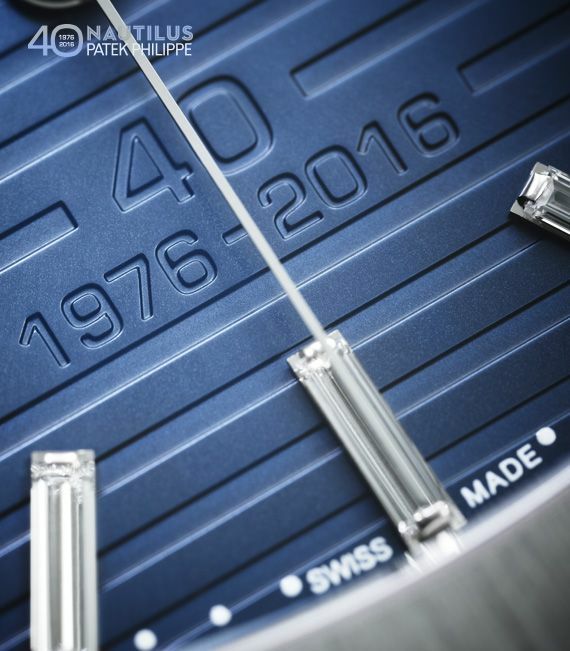 The case is crafted from solid platinum 950 to celebrate the 40th anniversary. With its inimitably cool silvery hue, it not only ranks among the most precious of noble metals but is also very challenging to machine. Its tough, ductile consistency abrades drill bits, milling heads, files, and polishing tools much more severely than gold or steel, distinctly intensifying the effort invested in working the three-part case and the link bracelet of the Nautilus with many forms of finissage, such as chamfering, satin-finishing, sandblasting, and mirror polishing. The result is a look that projects a multitude of aspects from a gentle shimmer to a bright gleam, in ways unmatched by other timepieces. 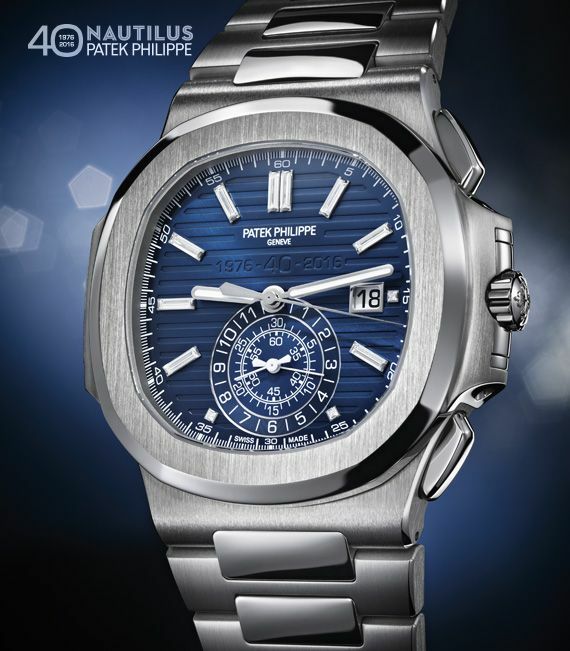 As all other Patek Philippe platinum watches, the new Nautilus Ref. 5711/1P is fitted with a flawless rare white Top Wesselton diamond (approx. 0.02 ct.) in the bezel above the lugs at 6 o'clock. The dial of the Ref. 5711/1P is a special anniversary version as well. It is made of 18K gold and unlike the original Nautilus features a dark blue hue with a bright/dark gradation from the inside to the outside that perfectly complements the cool shimmer of platinum and assures a superb contrast of the hour markers: 12 applied batons in 18K white gold with flawless Top Wesselton baguette diamonds with a total weight of approx. 0.34 ct.). 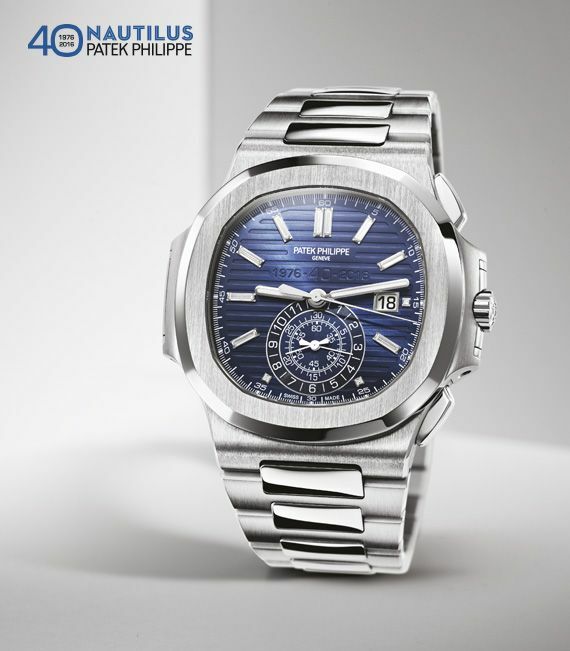 The blue sunburst background features the typical horizontal Nautilus embossing and, in the bottom half of the dial, the very discreet two-line anniversary citation "40" and "19762016". The date aperture, also slightly larger in proportion to the bigger case, is located at 3 o'clock and set in a polished 18K white-gold frame. Against this backdrop, the luminous baton-style hour and minute hands in white gold and a svelte, counterbalanced seconds hand keep track of the time with superior accuracy. The daily rate deviation is merely -3 to +2 seconds, clearly exceeding the benchmark officially imposed on a chronometer. This high rate accuracy is delivered by the self-winding caliber 324 S C movement, which enjoys icon status among connoisseurs and enthusiasts of watchmaking artistry. Like hardly any other self-winding movement, it unites tradition and innovation with precision, dependability, and artisanal ingenuity. The heavy central rotor in 21K gold automatically delivers the power needed for fast and reliable winding. The Gyromax® balance with the Spiromax® balance spring both are Patek Philippe inventions guarantee high rate accuracy. The finishes of the components are executed almost entirely by hand, including Geneva striping for the bridges, chamfering and polishing for the edges, polishing for the sinks, circular graining for the gold rotor, perlage for the plate, and gold-filled engravings. Visible through the sapphire-crystal case back, they celebrate the beauty of Genevan watchmaking traditions as upheld by Patek Philippe. The Nautilus Ref. 5711/1P 40th Anniversary in platinum 950 is being crafted in a limited edition of 700 individually numbered watches. Each one comes in an anniversary box that also contains the Certificate of Origin and an anniversary document. Made of brown natural cork, the box is an authentic replica of the stylish 1976 original. Like the original Nautilus, it evokes vivid associations with the proud ocean liners that inspired the porthole design of the casually elegant timepiece. The 40th Anniversary cork box features polished stainless steel frames for the base and the hinged cover. 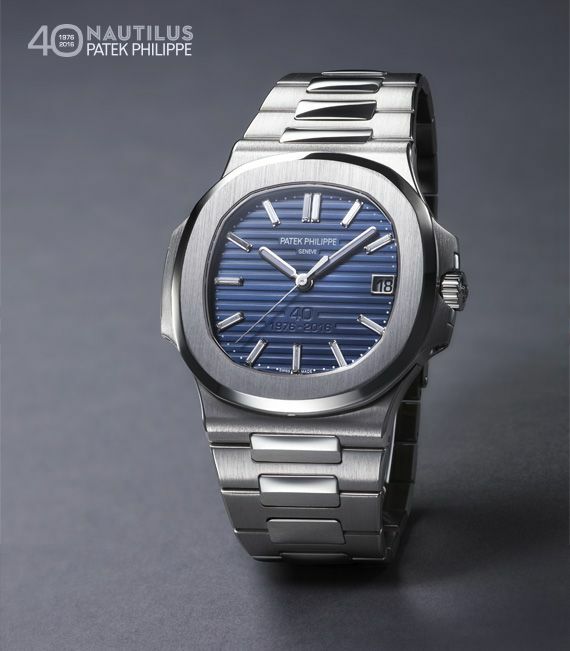 The steel plaque on the front side, also a faithful replica of the 1976 original, displays the collection name "Nautilus" in cursive script and the PATEK PHILIPPE GENEVA signature logo. Patek Philippe presents the self-winding flyback chronograph Ref. 5976 in 18K white gold as the second anniversary model to commemorate the 40th birthday of the Nautilus collection. It is a symbolic choice because its predecessor, the Ref. 5980 was the first Nautilus chronograph that in 2006 crowned the casually elegant Patek Philippe collection when it celebrated its 30th birthday. However, the current anniversary chronograph Ref. 5976 in 18K white gold comes in a limited edition of 1300 watches of a distinctly more prominent format. With a width of 49.25 mm (3 to 9 o'clock, including screw-down crown), it is 3.6 mm wider than the predecessor model. This format emphasizes its unique aesthetic appeal with the bilateral case bulges. Both chronograph pushers are harmoniously integrated in the design and conveniently operable. Moreover, the crisp legibility of the chronograph functions was further optimized. From the case and bracelet to the foldover clasp, the watch highlights Nautilus-typical finissage techniques such as the vertically satin-finished bezel with shiny chamfers and the alternating matt/mirror-polished bracelet links, all meticulously executed by hand. These lavish finishes underscore the nobility of 18K white gold and bring the contrasting dark blue dial to the fore. It benefits from the larger format of the watch and affords more space for the enlarged aperture date that is set in a mirror-polished white-gold frame. The monocounter at 6 o'clock has grown as well, which makes it easier to read the results of short-time measurements. Its three concentric scales include the 12-hour counter on the outside as well as the minute counters from 1 to 30 in the middle and from 31 to 60 on the inside. The applied hour markers flawless Top Wesselton baguette and princess-cut diamonds discreetly encircle the dial and accentuate its finesse. It features the horizontal Nautilus-style embossed decor and, in the upper half of the dial, the anniversary citation "1976 40 2016". The proprietary chronograph movement CH 28-520 C, developed and crafted in-house, is wound automatically by a heavy 21K gold central rotor. The start/stop and flyback/reset chronograph functions are controlled by a classic column-wheel mechanism with a vertical disk clutch that handles the engagement and disengagement operations. Because it is virtually friction-free, the chronograph hand can be used as a continuously running seconds hand without causing mechanical wear. Further features include the instantaneous date change with a switching cycle of one-tenth of a second as well as the Gyromax® balance invented by Patek Philippe. The balance is paired with a patented Spiromax® balance spring made of high-tech Silinvar®. It is totally antimagnetic, corrosion-resistant, and breathes concentrically thanks to the Patek Philippe terminal curve in the hairspring plane, which further optimizes isochronism. This highly precise micromechanical marvel with a rate tolerance of -3 to +2 seconds per day can be observed at work: the Ref. 5976/1G is endowed with a sapphire-crystal back that also reveals the elaborate finissage details: the gold rotor and bridges with Geneva circular graining, chamfered and polished edges, polished bores and gold-filled engravings accentuated with blued screws as well as sparkling ruby-red bearing jewels. The Nautilus Chronograph Ref. 5976/1G 40th Anniversary in 18K white gold is being crafted in a limited edition of 1300 numbered watches. Each one comes in an anniversary box that also contains the Certificate of Origin and an anniversary document. Made of brown natural cork, the box is an authentic replica of the stylish 1976 original. Like the original Nautilus, it evokes vivid associations with the proud ocean liners that inspired the porthole design of the casually elegant timepiece. 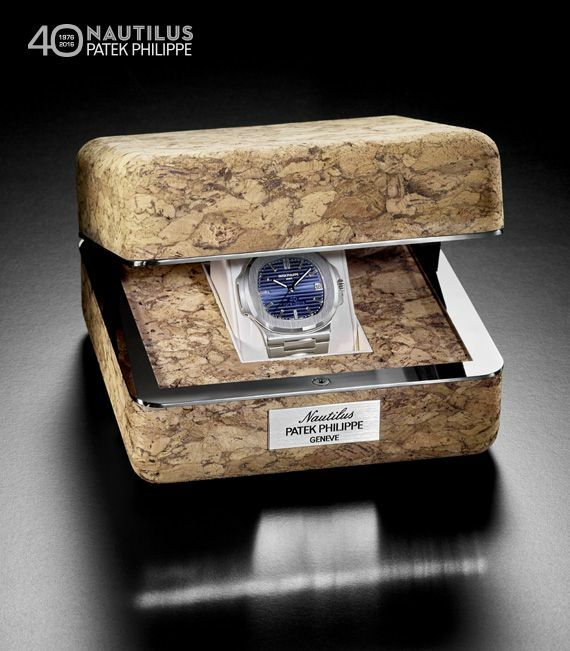 The 40th Anniversary cork box features polished stainless steel frames for the base and the hinged cover. 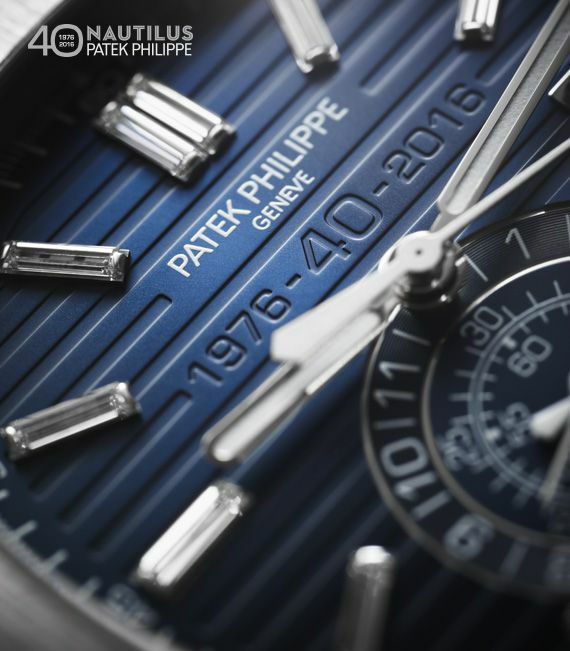 The steel plaque on the front side, also a faithful replica of the 1976 original, displays the collection name "Nautilus" in cursive script and the PATEK PHILIPPE GENEVA signature logo. Anniversary embossing "1976 40 2016"